This is a workshop designing your own garden/coffee table. 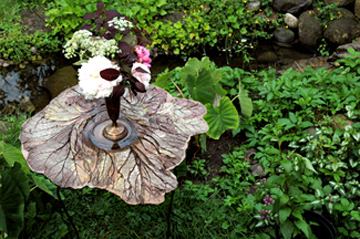 We will make 2 foot round table tops with a choice of leaves as the season evolves . Your table will be taken home on a set board to cure for 24 hours. I'll demonstatre how to colour stain cement. Sturdy steel bases are supplied. I ask that you bring a sandwich and I'll provide the salad, cold drinks, tea, coffee.